You are the owner of a large company. The goal of the game is to develop your town, so that you can build all of the major landmarks before your rivals do. Note: The cards in this game depict various establishments, and are laid out on the table for play. They are never held in your hand or shuffled. 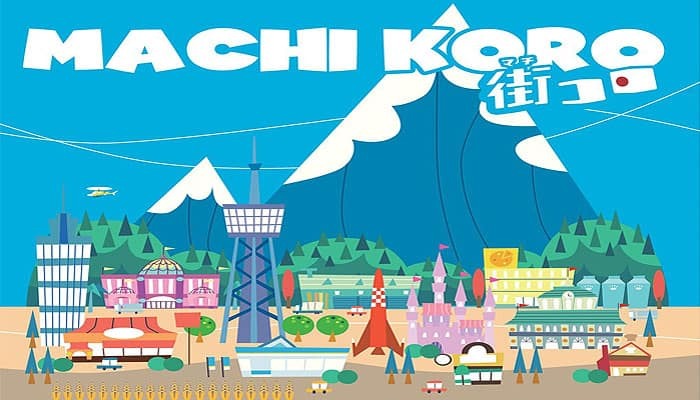 Place the two starting establishments (Wheat Field and Bakery) face up, and the four Landmarks (Station, Shopping Mall, Amusement Park, Radio Tower) face-down (Under construction) in front of each player. This is each player's starting town. 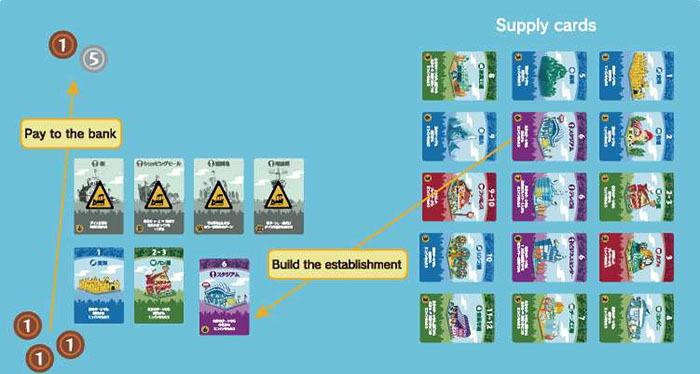 (When playing with 3 players or less, the extra cards are not used.Group each supply establishment together and lay them out on the table so they are easy to see. Give 3 coins to each player. Leave the extra coins on the table where they are easy to get. (Players who earn coins from the Bank will take the coins from the table). Choose the first player to play using a suitable method. Players take turns in clockwise order. Players begin their turn by rolling the dice. The establishment which matches the dice roll activates its effect. (The player that owns the respective establishment earns income). End of their turn, the player can build one new establishment or complete one landmark. The player to complete all four landmarks first wins the game. When two dice are rolled, only the facilities that equal the sum of the rolls are valid. The game progresses in turns, where each player rolls the dice. At the beginning, players begin their turn by rolling one die. If the player owns a completed "Station" landmark, he or she can roll two dice. (The player can select if he or she wants to roll two dice or one). Players earn income based on the dice roll and the effects of the establishments that they own that match that roll. (Receive coins from the bank or from other players, depending on the effect of the establishment). There is no limit to the amount of coins you can hold. You can also exchange coins freely. Get income from the bank, during anyone's turn. Get income from the bank, during your turn only. Take coins from the person who rolled the dice. Get income from all other players, but during your turn only. When income and payment happens at the same time, payment is processed first. If the paying player cannot afford to pay the full amount, they pay what they can and the rest is exempted. (Your coin total never reaches less than zero). The receiving player is not compensated for the lost income. Player A rolls a "3". Player B owns a Cafe in his town, so Player A is charged one coin. However, Player A has no coins, so he does not have to pay anything. Afterwards, Player A receives two coins from the bank for the two Bakeries in his town. If multiple transactions take place from one dice roll, they are processed in counter-clockwise order. Player A rolls a "3". Player B owns 3 Cafes, and Player C owns 2 Cafes. Player B charges 3 coins and Player C charges 2 coins, but Player A only has 3 coins. Payment is processed in counter-clockwise order. Player A first pays Player C two coins. He has one coin left, which he pays Player B. The two more coins Player A owes Player B is exempted. 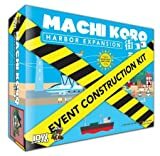 Once during his or her turn, players can build a new establishment or complete a landmark that is under construction. This is done by paying the coin amount written on the bottom left corner of each card to the bank. You cannot build an establishment if the cards are sold out. When completing a landmark, turn the card face up. The landmark's effects are now active.